The beauty of this recipe is that you can use any nut butter you choose! Peanut butter is classic, but try it out with almond butter or even sun butter (made from sunflower seeds). With all the nut allergies these days, sun butter is your best bet if you’re making these for a school function or a bake sale. Nut butter provides healthy fats and protein, which keep us fueled and full throughout the day. So who’s ready to make some sweet treats? Line a mini muffin tin with 24 liners. Melt the chocolate and coconut oil in a microwave safe bowl for 60 seconds. Stir, and if needed heat up an additional 30 seconds until completely melted. Fill up the liners about 1/3 of the way with the chocolate mix. Refrigerate for 10 minutes. While refrigerating, mix the nut butter and protein powder. If the mixture is still runny, add in 1 extra tablespoon of protein powder. Roll into little balls and squish the mixture on top of the chocolate in the liners. 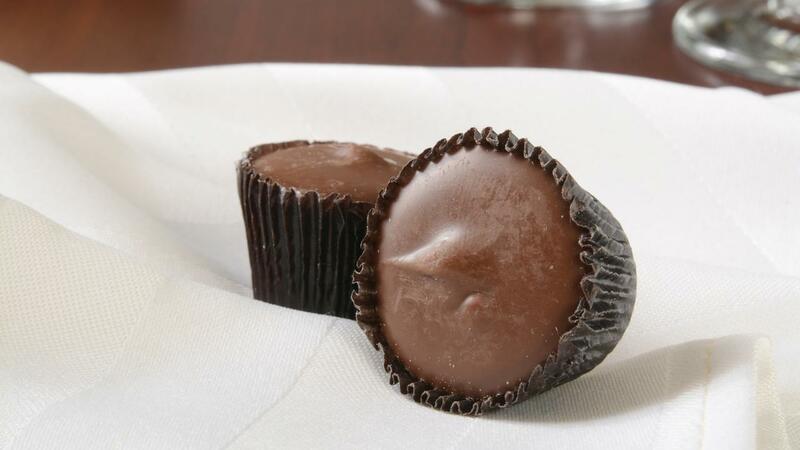 Add the rest of the chocolate on the top of the peanut butter so it is completely covered. Refrigerate the cups for an additional 10 minutes, and enjoy!